Rimorchiatori Spezzini, a subsidiary of the Scafi Group, contracted Damen Shipyards Group for two new Damen ASD Tugs 2411. The order comes as part of Scafi’s plans to expand its fleet in response to the newly assigned harbor towage concession in the port of Safi, Morocco. 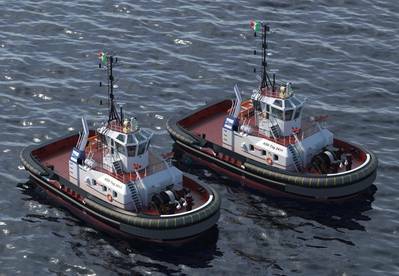 The two new ASD Tugs will be based in the Port of La Spezia, an important maritime hub for commercial markets in North Italy, Austria, Switzerland and Germany. The ASD 2411 will be an added value for the operations in the confined waters of the port; assisting large container vessels, bulk carriers and gas tankers, in particular. In terms of bollard pull, Damen’s ASD Tug 2411 packs a 70-ton punch. The tugboats are scheduled for delivery in Q1 and Q2 2019 respectively.